The small but beloved and scenic town of Bay St. Louis, Mississippi has many great spots for engagement and bridal portrait sessions. Of course, if there's one thing in life that's certain, it's change. One of my previous favorite locations in the Bay St. Louis area was the remains of a bank near the beach, where all that was left standing at the site after Hurricane Katrina washed the building away was the old vault. Weathered, grungy walls like this make for a fantastic background for photographs. That spot no longer exists, as the bank has been rebuilt in a development revival of this beachfront area... good for the town, but unfortunate for me as a photographer! 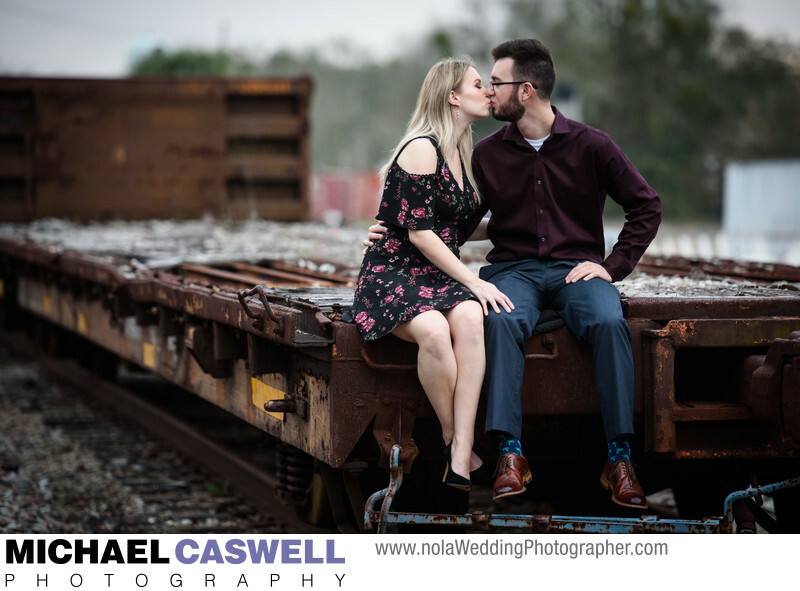 However, the revitalized area near the newly constructed harbor still had some great spots to work with for this Mississippi couple, and then we headed over to the area around the old train depot to continue the session. As soon as we arrived there, my eye immediately went to the decrepit and rusty remains of an old rail car sitting on the tracks. Fortunately, the groom had an old jacket in his car that he was willing to place down on the rusted iron for them to safely sit on, and we captured a beautiful series of shots. The amazing visual contrast provided by this kind of juxtaposition of an attractive and well-dressed couple on or near a grungy old piece of machinery is always appealing to me.